Global workflow management system market expected to reach USD 22.1 billion by 2025, at a CAGR of 22.9% between 2019 and 2025. The increasing use of technology in the BFSI sector is likely to drive the workflow management system market over the forecast time period. This report analyzes and forecasts the workflow management system market on a global and regional level. The study offers historical data for 2016, 2017, and 2018 along with a forecast from 2019 to 2025 based on revenue (USD Billion). The assessment of workflow management system market dynamics gives a brief insight into the drivers and restraints for the workflow management system market along with the impact they have on the demand over the years to come. Additionally, the report also includes the study of opportunities available in the workflow management system market on a global level. The report gives a transparent view of the workflow management system market. We have included a detailed competitive scenario and portfolio of leading vendors operating in the workflow management system market. To understand the competitive landscape in the workflow management system market, an analysis of Porter’s Five Forces model for the market has also been included. The study encompasses a market attractiveness analysis, wherein all the segments are benchmarked based on their market size, growth rate, and general attractiveness. The study provides a crucial view of the workflow management system by segmenting the market based on deployment, component, end-use industry, and region. 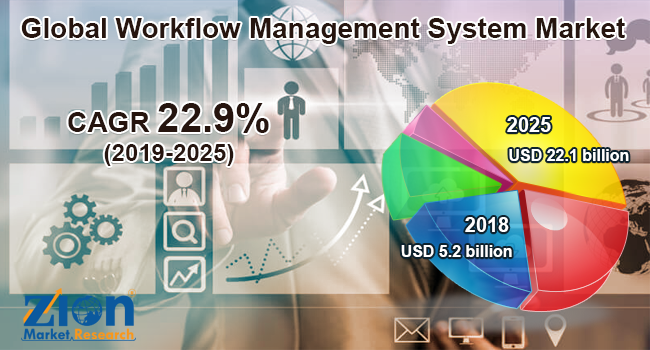 All the segments of the workflow management system market have been analyzed based on present and future trends and the market is estimated from 2019 to 2025. By deployment, the global workflow management system market is bifurcated into on-premises and cloud. Software and services comprise the component segment of the global workflow management system market. The end-use industry segment includes retail, BFSI, IT and telecom, healthcare, government sector, transportation, manufacturing, and others. The regional segment of the workflow management system market includes the current and forecast demand for the Middle East and Africa, North America, Asia Pacific, Latin America and Europe with further division into the U.S., Canada, Mexico, UK, France, Germany, Italy, Spain, China, Japan, India, Australia, South Korea, Brazil, Argentina, UAE, Saudi Arabia, and South Africa. Some key players of the global workflow management system market are Xerox Corporation, Oracle Corporation, Software AG, Pegasystems Inc., IBM Corporation, Nintex Global Limited, Source code Technology Holdings, Inc., Appian, Bizagi, and Newgen Software Technologies Limited, among others.